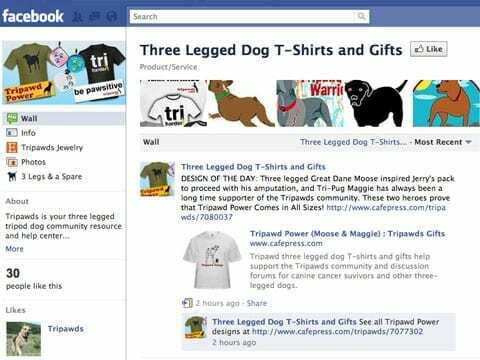 If you have not already done so, go to the new Three Legged Dog T-Shirts and Gifts Facebook page right now and click Like! Cafe Press Coupon Codes and More! 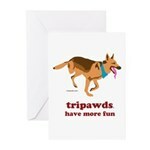 Click the Tripawds Jewelry tab to see the most recent additions to the Tripawds Etsy Store. 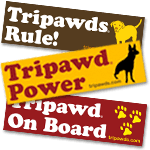 Use the Photos tab to upload pictures of you in Tripawds apparel with your pup. And check out the 3 Legs & a Spare tab for information about the Tripawds Canine Amputation Handbook. 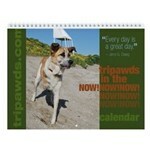 Then watch he Wall for posts with links to popular items in the Tripawds Gift Shop! While you’re there, use the Facebook Like and Send buttons we’ve added to send favorite t-shirts, cards, mugs and more gifts to your friends!